Think about your favorite Christmas moments. Do they involve family, friends, food, music or lights? Most likely it’s a combination of those and other things special to you. Grandma’s pumpkin pie, a favorite Christmas carol and Uncle Joe’s usual jokes. For many folks across the Midwest and other parts of the United States, it also involves Branson, Mo.—one of the country’s favorite holiday destinations. With its combination of shows, lighting displays, festivals and old-time charm, Branson’s Christmas celebration has become as much of a tradition for many families as watching “It’s a Wonderful Life.” Through what is called the Ozark Mountain Christmas, Branson is able to capture the most treasured aspects of the season and draw them into one fantastic family experience. According to Tammy Johnson, the director of operations for the Branson Tourism Center, the Ozark Mountain Christmas is a celebration that captures the true spirit of a traditional American Christmas. From historic downtown Branson to Lake Taneycomo and Silver Dollar City, the entire area joins in the celebration by providing its own unique events and displays. There are two drive-through lighting displays, a five-story Christmas tree, visits from Santa and a fantasy princess, as well as a major parade and nativity lighting ceremony to honor the true meaning of the holiday. Considered to be the centerpiece of the celebration is Silver Dollar City’s world-class festival, An Old Time Christmas, which has been recognized as one of the nation’s top theme park Christmas celebrations. 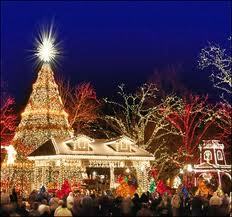 During An Old Time Christmas, the park is transformed into what Branson.com calls a “glowing Christmas spectacular” with more than four million sparkling lights, an assortment of handmade gifts, foods of the season and Broadway-style productions of both “A Christmas Carol” and “It’s a Wonderful Life,” produced exclusively for Silver Dollar City. Also known as the entertainment capital of the Midwest, Branson, which is legendary for its wide variety of live entertainment shows, offers hundreds of Christmas-themed options at many of its most popular venues. Visitors can select from holiday spectaculars from Dolly Parton’s Dixie Stampede, the Gatlin Brothers and Debbie Boone, Mickey Gilley, Tony Orlando and more. And for those who want to celebrate in a more engaging experience, the Christmas on the Trail Chuck Wagon Dinner and Show offers a chance to eat a meal straight off a vintage 1800s chuck wagon while listening to songs of the season and, afterward, experiencing the 2.5-mile lighting display at the Shepherd of the Hills Homestead. With so many options, Branson is one of the most beloved destinations for families and couples during the Christmas season. And, at Stay in Branson, we are proud to offer great accommodations for those who take the opportunity to come join in the fun. Located at the Pointe Royale Resort, our vacation rental properties provide resort-style living conditions right in the middle of it all. Guests can experience Branson and then return to a quiet, privately owned vacation property and resort to unwind after the excitement of the day. With fall being Branson’s busiest season, however, it’s important to book your reservation soon. Take the opportunity to experience the most wonderful time of year in one of the most wonderful locations in the country. Call us at Stay in Branson to book your reservation today!